(L-R) CSUN Associated Students (AS) Senator Paulina Silva, AS Vice President Zahraa Khuraibet, state Controller Betty Yee and AS President Jonathan Goldenberg meet during Yee's visit to campus, Oct. 18, 2017. Photo by Lee Choo. State Controller Betty Yee, California’s highest-ranking female state elected official, visits the California State University, Northridge campus Oct. 18, 2017. Photo by Lee Choo. 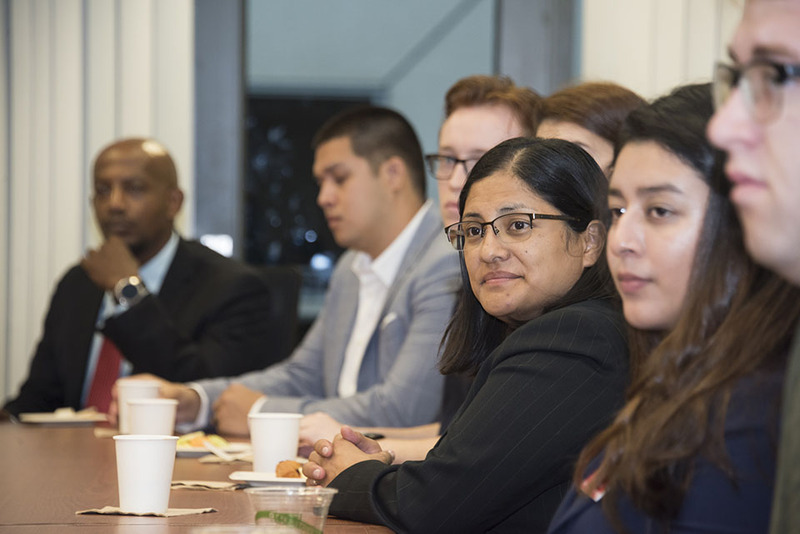 CSUN faculty and business honors students have a rare opportunity to meet and engage in candid discussion with state Controller Betty Yee (center, in white blazer) at the David Nazarian College of Business and Economics, on Oct. 18, 2017. Photo by Lee Choo. CSUN business honors students and student government representatives take advantage of a rare opportunity to meet and talk with state Controller Betty Yee at the David Nazarian College of Business and Economics, on Oct. 18, 2017. Photo by Lee Choo. 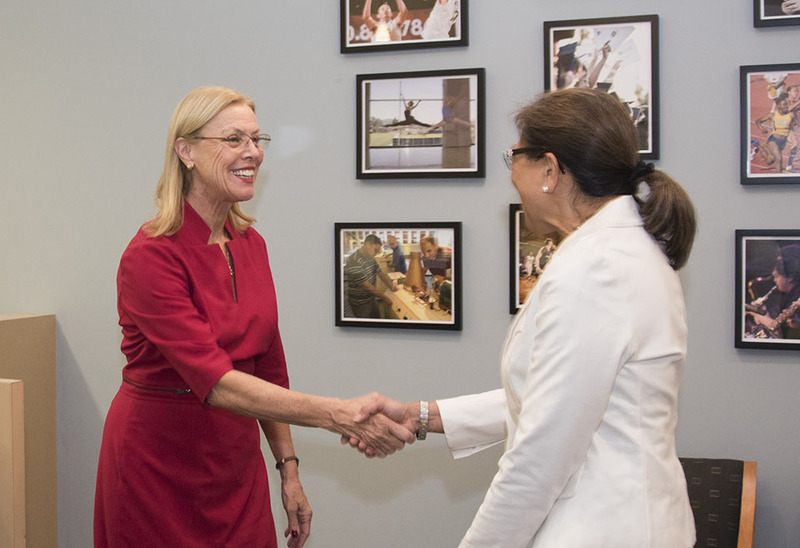 State Controller Betty Yee, California’s highest-ranking female state elected official, meets California State University, Northridge President Dianne F. Harrison, during Yee's visit to campus Oct. 18, 2017. Photo by Lee Choo. 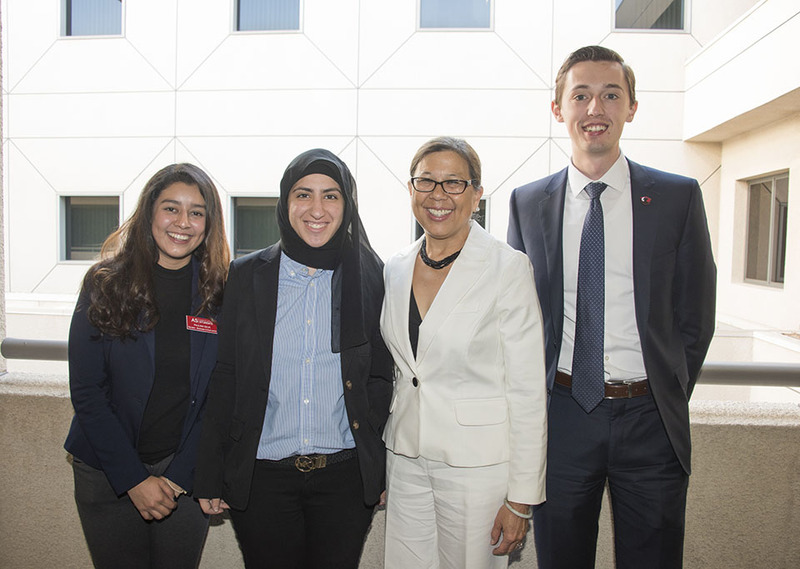 California’s highest-ranking female elected state official visited the California State University, Northridge campus Oct. 18, taking the opportunity to visit with students and CSUN President Dianne F. Harrison, and learn more about the university’s programs. 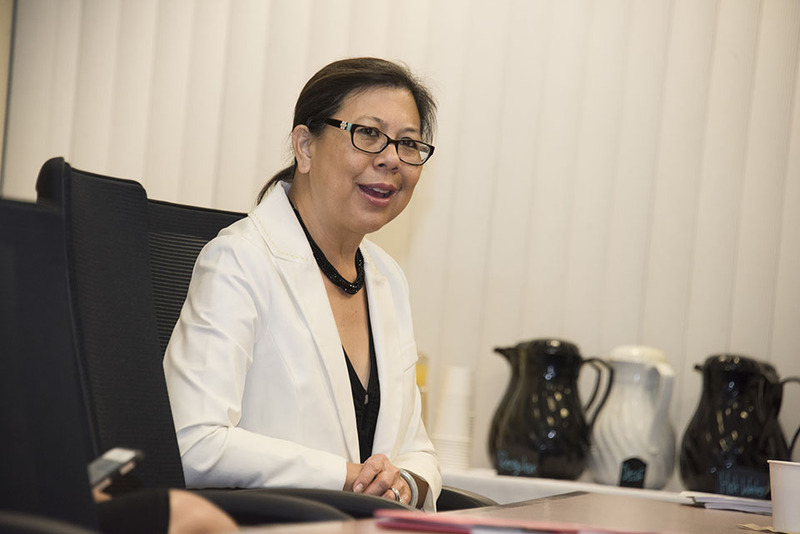 David Nazarian College of Business and Economics faculty and students had a rare opportunity to meet and engage in a candid discussion with state Controller Betty Yee. Based in Sacramento, Yee made an early-morning stop at CSUN, organized by the university’s Office of Government and Community Relations. After spending more than an hour chatting with about a dozen CSUN students, Yee said she was impressed and invigorated by the grit, tenacity and community-service mindset of the Matadors. Many of them spoke with her about college affordability, as well as the importance of internships and volunteerism. After the session with students, faculty and administrators, Yee met privately with President Harrison and Director of Government and Community Relations Francesca Vega and toured the campus. She also pointed out that 2018 is a gubernatorial election year for California — as well as for all statewide offices, including hers — and that the state will have a new governor, with Gov. Jerry Brown declining to run for another term. In addition to Greuel, several Nazarian College administrators and faculty joined the session with Yee, including Deborah Cours, interim dean; Robert Sheridan, managing director of career education and professional development; John Zhou, chair of the Department of Finance, Financial Planning and Insurance; Rafi Efrat, director of CSUN’s Volunteer Income Tax Assistance (VITA) Clinic and the Bookstein Low Income Taxpayer Clinic; Deborah Heisley, director of graduate programs in business and professor of marketing; and Vincent Covrig, professor of finance, financial planning and insurance. Jonathan Goldenberg, Associated Students (AS) president, and Zahraa Khuraibet, AS vice president, also helped welcome the controller to campus. Senior and political science major Adam LaBrie, a transfer student from Pasadena City College, told Yee that he thought CSUN staff and faculty stood out from other universities for their commitment to helping students pay for and complete college. “In the process of applying, I noticed that CSUN was more willing to admit where there are shortcomings with college affordability — and they were able to point me toward the resources I needed,” said LaBrie, now serving as AS chair of legislative affairs. Yee shared her own background with the CSUN students, explaining that she, too, was a first-generation college student who depended on California’s public education system. Greuel added that when she speaks with the heads of the region’s largest accounting firms, they praise their CSUN alumni employees, who share that type of “bootstraps” background.